Preheat oven to 400 degrees F. If you are using coconut oil, it can be solid depending on the temperature, so if it’s solid or half-liquid just scoop it into the pie plate and put the pie plate in the oven for a few minutes while you are making the sauce, to melt and liquify. If you are not using coconut oil, just add your oil to the pie plate and spread evenly, with no need to warm in the oven. To make the sauce: mix together the sake, tamari, and garlic in a small bowl. Remove the pie plate from the oven if needed. Make sure the bottom of the pie plate is covered with a thin layer of oil (so you can get your shrimp out later). Layer your shrimp in a single layer in the pie plate. Pour the sake, tamari, and garlic sauce over the shrimp. Drizzle with the sesame oil. Sprinkle the sliced scallions on top. 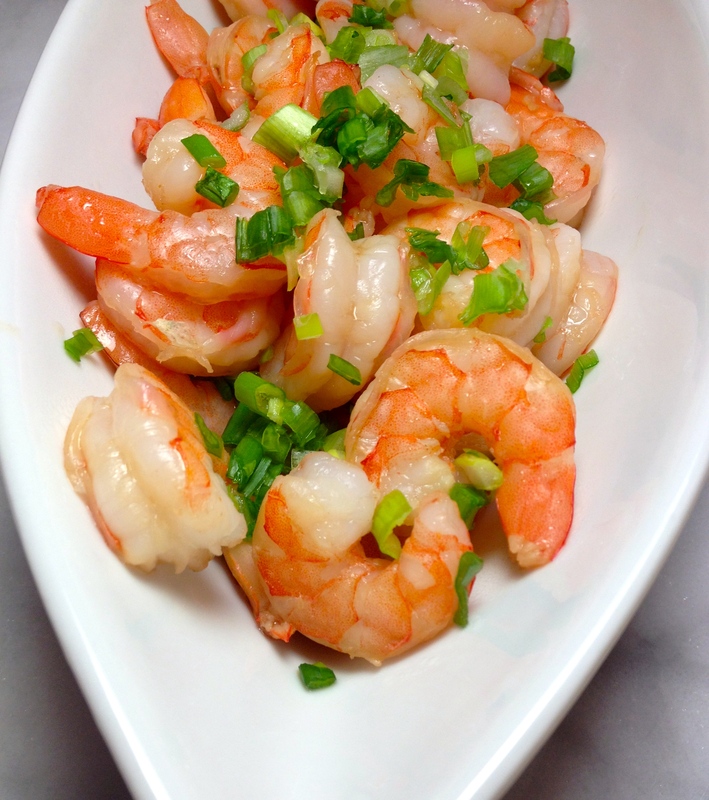 Resist the temptation to stir – you want layers in the pie plate of: coconut oil, then shrimp, then sauce, then sesame oil, then green onions. Bake the shrimp at 400 degrees F for about 12 minutes. To check doneness, the shrimp should be pink and white through, but still slightly translucent (try not to overcook which will be rubbery). I usually cut into one to make sure it is cooked through. If you think they are almost-almost done then take them out and let them sit for a few minutes while they finish cooking. Sprinkle with more sliced scallions for serving, if desired.